Sometimes we don’t need to travel to exotic linked data sources to discover treasure troves of precious information about our audience’s desires, aspirations, fears, and complaints. Sometimes that treasure is just far as a phone call to the customer care department. Sometimes it is just a click away in the Q&A and/or Forum section of our site. And sometimes it’s just there, freely offered by our own competitors to everybody able to retrieve the correct information from them. Understanding what our audience is really talking about, what the specific language is that they use, and what their topics and themes are can be easier than we may first think. Be aware that I don’t mean that extracting useful information about our audience is easy – that would be trivializing the audience targeting work – but I mean that nowadays, thanks to the social nature of the web, it is much easier finding valuable sources from where retrieving information than just ten years ago. 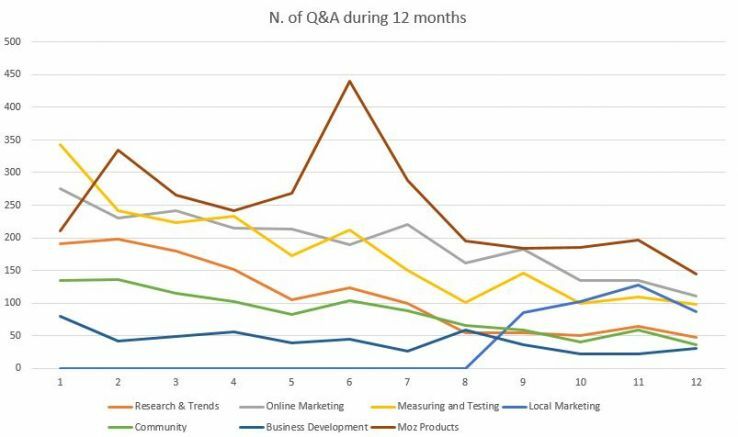 my previous post, I asked the editorial team at Moz to let me analyze one year of Moz Q&As, with the purpose of identifying what the community was most frequently talking and asking about, and what they discussed most often, and so trying to paint a better portrait of the community itself. Finally, I wanted to offer the Moz team insight that can help them offer a better experience to the users. I don’t know if was able to understand the “100 most asked questions,” as Rand asked, but the method I used, and that any of you can refine, is the correct one for offering that kind of list. The “real categories” are necessary information, because they help organize the questions into very recognizable macro-topics. I decided to use Wordle to create word clouds. Wordle has the great option of letting you hide words that complicate your analysis, letting you focus on the relevant words. Given the previous value, questions with more answers matter more than questions with less answers. I didn’t take into account the number of thumbs up of the question as metric for the simple reason that very rarely is a question thumbed up. My decision would have been different if I was also taking into consideration the answers. What other tools did I use for conducting my analysis? None but Excel. First problem: Which number should I consider in my analysis? The raw number of questions or the one including the duplicates? The answer was easy: the raw number. In certain cases, though, I preferred checking the de-duplicated list as well, in order to confirm my first impressions. What are the Q&A users talking about? Interested in content, but not as interested as it is in relation to SEO (as we will see later). 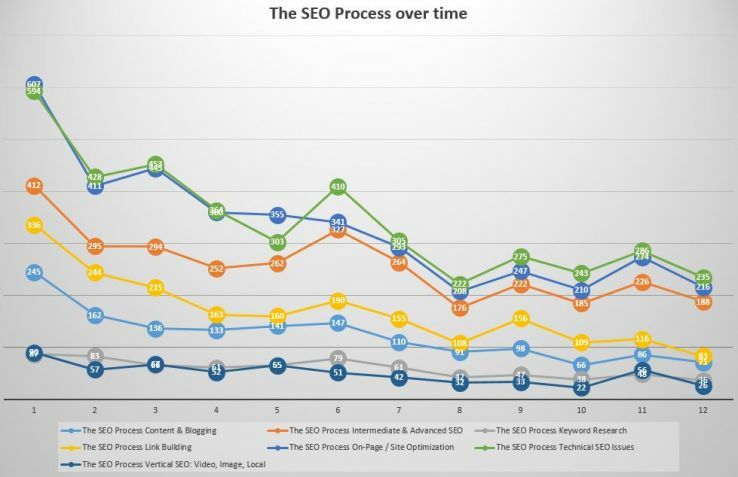 We can easily see how “The SEO Process,” which includes all the categories directly related to SEO in the Moz Q&A, stands far above all the others. Q&A is also the space where Moz users can publicly ask questions to the Help Team about the Moz Tools, and that specific nature of this category explains why “Moz Products” is the second most-popular topic in the Q&A. “Local Marketing,” a category that was only created in January 2014, has quickly reached an interesting volume of questions. This could be telling us that Moz did well creating Moz Local, because local search marketers are an important percentage of the Moz users. 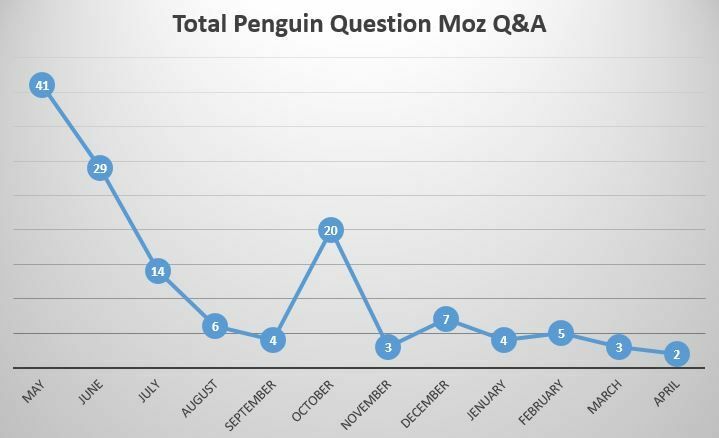 Be aware, then, that the decrease in the number of questions we see in the charts is not due to a diminished interest about SEO by the users, but—as described in my previous post—to the design of the Moz.com site in comparison to the old SEOmoz.org one. The SEO Process category comprises seven subcategories. classic SEO still is the most important source of doubts for the Moz community. 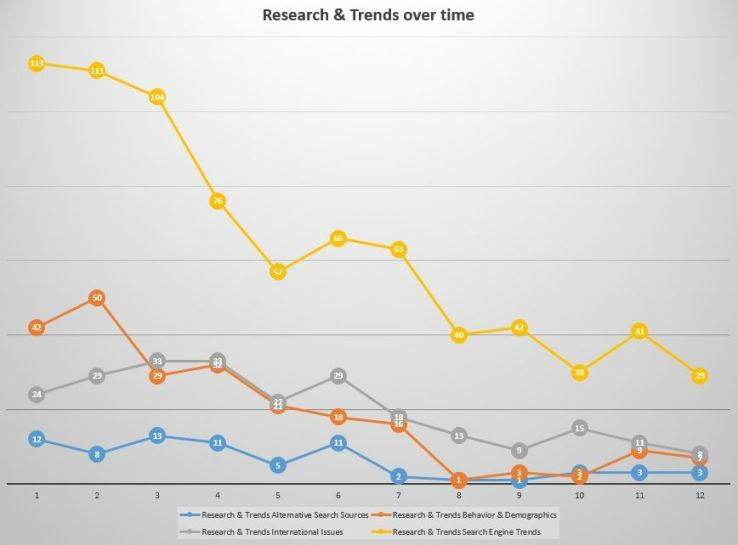 A reason for the success of these categories, confirmed by the third position of Intermediate & Advanced SEO, could also be the increased difficulty of technical SEO, which has a steep learning curve—especially for the new generation of SEOs coming from the marketing/communication fields and not engineering/computer science. Content & Blogging, which could be considered the “content marketing” side of the SEO Process, is only fifth, after the supposedly dead Link Building. The Vertical SEO and Keyword Research categories are the last ones, and while we can consider Keyword Research somehow as a smaller topical niche by comparison to much wider ones like Technical SEO, it’s quite surprising to see how questions about vertical searches (news, videos, images) are not so common. Sure, Local Search, which was the most important vertical, now has its own macro-category (Local Marketing), but nevertheless I was quite surprised. In this Wordle related to The SEO Process category, I omitted the word Google, because it was dwarfing all the others in the word cloud, making the analysis difficult. (drop, dropped, penalty, disavow, problem, manual…) or because they have understood their site is at high risk of penalization, or because they really have to make explicit its indignation. I want to start with the Link Building subcategory because it is a very good example of what I’ve just said above. 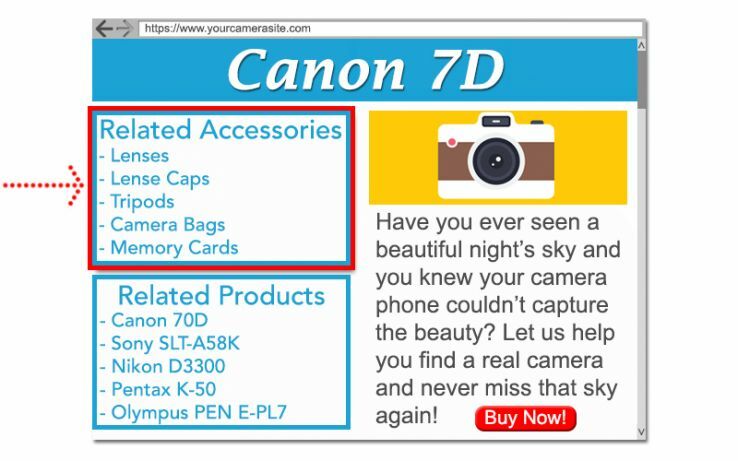 I removed the words “Link” and “Links” for better visibility of all the other words. penalty issues (Penguin, Penalty, Ranking, Disavow, Unnatural, Spam, Anchor…), about outdated tactics (Press Releases, Directories…) or risky ones (i.e. buying old domains with strong link profiles) and substantially blaming Google for letting other sites (especially competitors’ sites) rank well even if they have a supposedly spammy link profile (or because it is “killing” every link building option). questions about tools, usually link analysis tools for Penguin recovery (i.e. Link Detox, Cognitive SEO). new to the link building practice. A constant trend, though, is evident: people ask for creative help because they are working on so-called boring niches, or because they are dealing with niches usually dominated by spammy link building practices. This trend should make all us reflect when writing about link building, because we tend to write as if everybody was dealing with big brands and big budgets, when clearly it is not so. Another useful exercise is seeing how very specific topics return over and over in the Q&A. Obviously, for this very granular kind of analysis, it would be better to also have the question in the dataset, and not only its title. the importance of Q&A for feeling the pulse of our audience almost in real time. For this reason, using tools like Fresh Web Explorer for monitoring our keywords’ mentions in our own Q&A is essential in order to spot hot trends and eventually creating very timely content. there’s a word that I totally missed and that, IMHO, should be one of the most relevant ones in the words cloud: outreach. And there are very few questions and discussions about strategy, too, which is making me very sad. This is the king of all the categories of the Moz Q&A. And it is quite ironic, because if in the SEO-blog world technical SEO is losing visibility for other topics, at the end of the day the most common questions asked by SEOs are about the most classic of the SEO subjects. But what are the topics that worry the Q&A users the most? Duplication issues, and the related canonicalization issues, seem to represent a big portion of the SEOs’ worries when it comes to Technical SEO. Another classic cause for concern is a site’s migration. And, clearly, SEOs are worried about optimizing their site for Google (I feel sorry for Bing, but this is the real world). 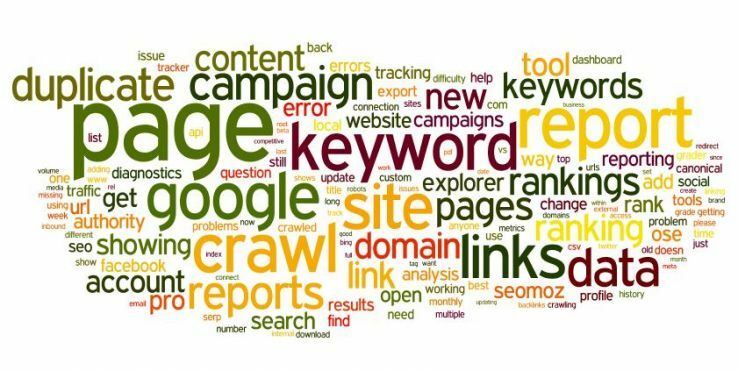 The presence of “Links” and link-related words is partly caused by the liberty given to users to publish questions up to five categories, therefore many questions that should fit almost exclusively in the Link Building subcategory are present also in the Technical SEO Issues one. internal linking, especially in relation to information architecture, budget crawl management and no-indexation of duplicated pages. Technical SEO issues generated by the most common CMS platforms (WordPress, Magento, Drupal, and Joomla), and, apart from Wordpress, this is the kind of topic that is not taken into much consideration in the Moz and YouMoz blogs. htaccess and regular expressions: Maybe Moz could think about a specific cheat-sheet or even creating an htaccess generator better than the ones already available online. The quality of the questions and answers, then, is higher than the Link Building one, even if it is still big the number of “newbie” kind of questions. question about a migration gone wrong or this less-silly-than-it-seems question about the use of the meta keyword tag. Both are confirming how the biggest part of the Moz Community is still composed by SEOs. The On-Page / Site Optimization is the second most-used category in all Moz Q&A, but this data is strongly influenced by the fact that users tend to categorize their questions in both Technical issues and SEO On-Page / Site Optimization. 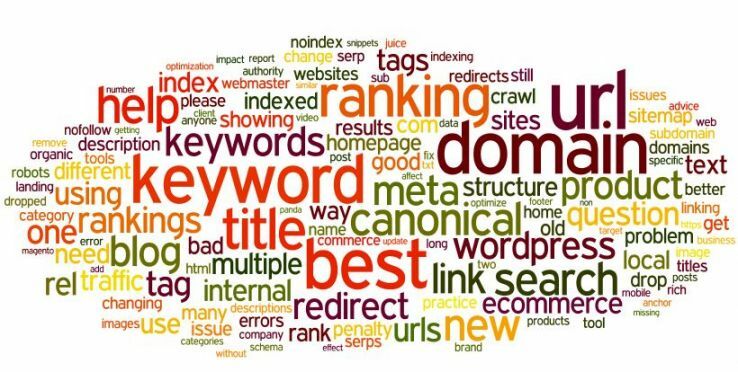 users still tend to think of on-page / site optimization in terms of keywords and related keyword-centric topics (i.e. Title tag). semantic search is barely present; we almost don’t see words like schema, semantics, structured data et al. Semantic SEO is still in an “early-adopters” phase (and this is what I believe). If we analyze our Q&A sections to finding new ideas, then this “absence” should aim us toward creating better and more understandable content about semantic search, so as to educate our audience and be consistent with our mission. This category suffers from the same problem as the previous one; users tend to categorize things as Intermediate & Advanced SEO questions that really should be attributed to other categories. For this reason, if we do not make a conscious de-duplication effort, the topics seem to be essentially identical to other categories. problem, then, is not being able to provide a clear definition of what is meant for Intermediate & Advanced SEO. Without defining this clearly, the concept of “advanced” totally depends on the SEO education grade of the users who are asking questions, and what emerges quite clearly is that the Moz Q&A public generally is not really advanced. rankings being lost, sites being de-indexed (or not indexed at all) etc. dominate. Information architecture, site structure, and crawlability tend to be asked almost exclusively in this category. special mention must be made for infinite scrolling, parallax design, and SEO for Ajax in general, which are topics that can be discovered as relevant to the community only if we consider metrics like page views and number of comments.Their popularity and level of of engagement, then, is confirming to us that there’s a space in the Moz Q&A for really advanced SEO questions; the problem is keeping them from sinking into a sea of basic SEO questions. as a method of ranking better. This could lead to a discussion about how much SEOs have really understood the importance of Content Marketing (and blogging) as an inbound tactic for making your site/brand relevant for the users, and hence able to earn popularity, shares, and links, and not just another SEO task for ranking better on Google. These are the Cinderellas of The SEO Process category. This is due to their very specific nature. A nature which is very clear to all users, and that means that we don’t find replicated topics like duplication or canonicalization, even if they still are present. like this question) or keyword mapping (like in this other example). That the number of questions posted in the Vertical subcategory has plummeted since the Local Marketing category was created. Video Search, with questions mostly about video hosting and YouTube optimization, is the second vertical for importance and frequency, followed by Images Search. News search, instead, is almost absent, with just one question that explicitly asks about that topic! As I have told before, the Online Marketing category included all the Inbound Marketing disciplines except for SEO. the unofficial title for this category should be “How to use other Online Marketing disciplines for SEO.” The outstanding presence of Google and, secondly, of SEO, is telling us just that. As we can see, the interest SEOs have for any single discipline determines the ranking of these subcategories. 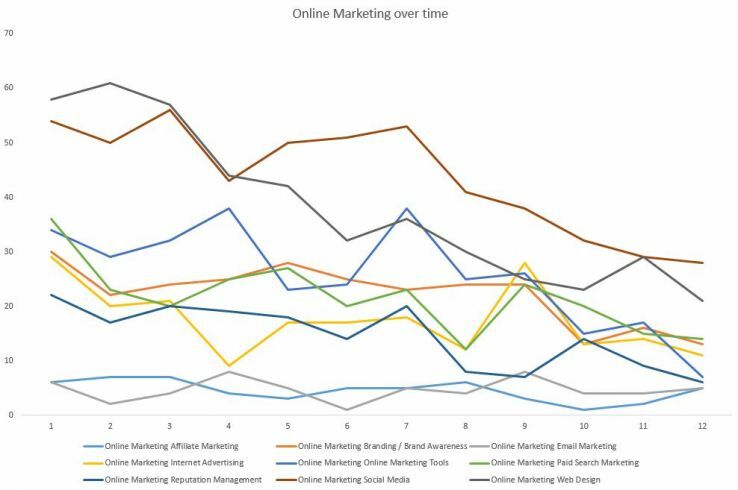 This explains why Social Media ranks first, immediately followed by Web Design, while a discipline like Email Marketing is ranking in the last position (tied with Affiliate Marketing). The poor performance of Affiliate Marketing is telling us that the SEOs working in that niche are not substantially part of the Moz community, or that they don’t consider Moz as their site of reference. Moz is mainly used by SEOs who use other online marketing disciplines in a wider Inbound Marketing strategy, but their main focus is the relation between those disciplines and the SEO process, more than specifically about their intricacies. A last observation we can do is that the Moz community is very practical and looks for tools that can make their professional life easier or for tips about how to better use the tools. Google+, Facebook, Twitter, and YouTube are the social media platforms people are asking about most. Social networks like LinkedIn or Instagram are present, too, but their presence is almost symbolic. Google+ is the most cited social network by far, and this should not surprise us if we remember how SEOs compose the vast majority of the Moz users and the importance Google+ has for SEO. the correct use of rel=”author” or rel=”publisher”, questions that are showing some sort of confusion about the real nature of these two tags, and the classical business’ doubt about giving too much power to authors with authorship, thinking it is detrimental to the brand. The questions about Facebook are practical, and widely range from very basic to more complex ones. Discussions that are quite common between social media marketers are present too, but tend to receive fewer views, even if their engagement grade is quite high. this question that asks if the same content tweeted by two different accounts could be considered duplicated content: No social media marketer could have even imagined asking this. It should not surprise us that Web Design is the second most asked-about online marketing discipline. Aside from the timeless love/hate relationship that SEOs have with web designers, the evolution of Google and the increasing importance of correct web development for SEO performance explains it. Google, Design, and SEO in order to better see the real topics users discuss in this subcategory. Asking questions about Mobile Web and Responsive Design. Site speed and performance optimization emerges as a third topic if we examine the questions more deeply. Generally, though, again we see SEOs asking questions and many times they categorize as Web Design questions that they also asked in some of the subcategories of The SEO Process, which may indicate to us that many users are convinced that, for instance, the duplicated content issues are somehow related to a poor design of the site (when, maybe, they should look more at information architecture). 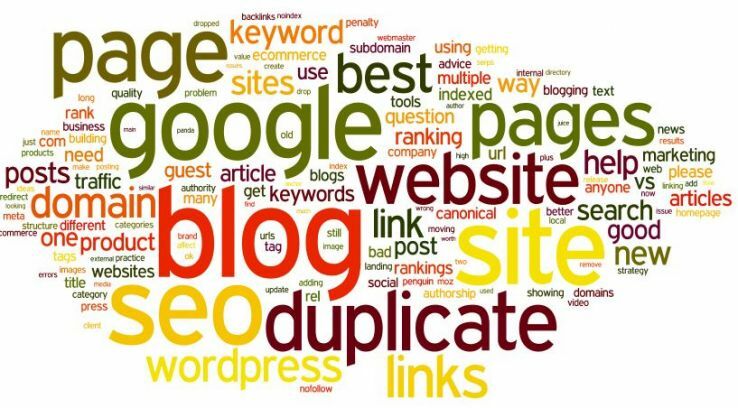 the vast majority of questions are directly related to the SEO process. Google Webmaster Tools, keyword tracking, Google Analytics (and others analytics needs, such as tracking phone calls, or alternative tools), the Google Places dashboard, and so on. Adwords. Instead, we have a very small and dispersed presence of questions about tools for Social Media (which comes third as topic) and other Online Marketing areas. Know about the importance of the others Inbound Marketing disciplines, but don’t deal directly with them? Or that they deal sporadically with those disciplines, therefore don’t feel the urgency of using specific tools for them? The remaining six online marketing subcategories generated fewer questions than the three previously described (1,019 vs. 1,291 questions). Moreover, many of their questions could be considered duplicates from other categories. Email Marketing > 56 questions. We easily see how AdWords is dominating the attention of the users, but we should not forget the emerging importance of Native Advertising or Social Advertising for Link Building purposes. It would be interesting matching this interest in AdWords with the data collected by the Industry Survey Moz did few months ago. In fact, we could probably notice how many SEOs also offer PPC services or (in the case of in-house SEOs) have AdWords as one of their tasks. Again, the predominant SEO nature of the Moz users emerges. Aren’t we saying all the time that SEO and Inbound Marketing are data-driven Internet Marketing disciplines? Yes, and search marketers are aware of the importance of measuring and testing, but nevertheless this category has only 1/7 of the questions that “The SEO Process” has (2,127 questions vs. 16,015). 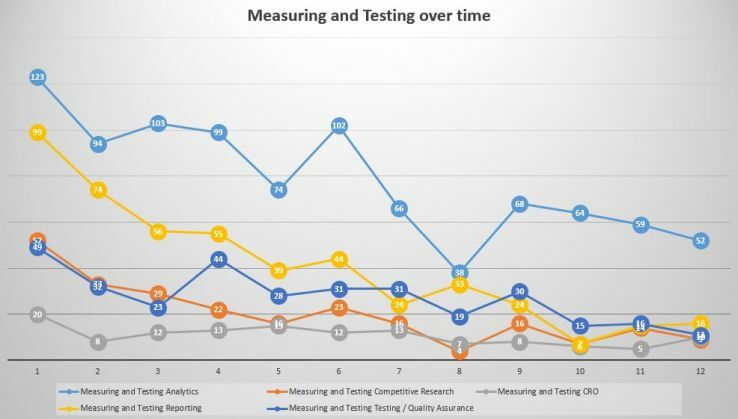 evident decline of Reporting over time made me wonder, could the reason behind its decline in interest be due to the fact that Moz users were asking questions in this category about the Moz Pro / Moz Analytics reporting functions? Once Moz created a better Moz Product category in Q&A, almost all those questions disappeared from Reporting. The chart seems to confirm and reassure us that the users of the Q&A are data-driven folks. But is it telling us the real story? “analytics” is a synonym of Google Analytics for the Moz users. Traffic should alert us. 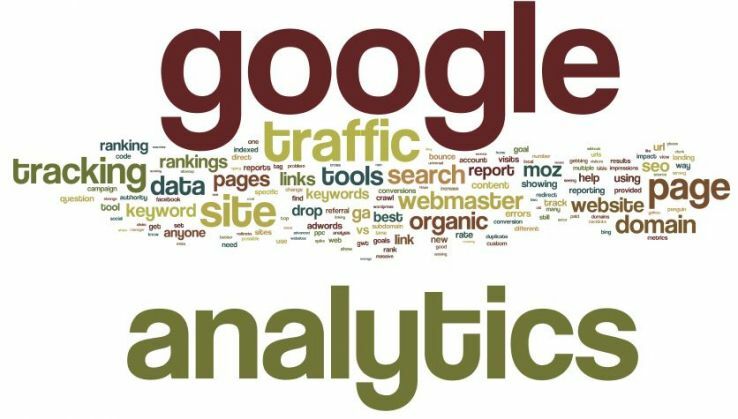 In fact, if we examining the Analytics questions one by one, we will discover how very frequently users refer to Google Analytics just because it was the tool that showed them a loss in organic traffic. Users, then, tend to publish these questions also in some of the most popular subcategories of The SEO Process category. 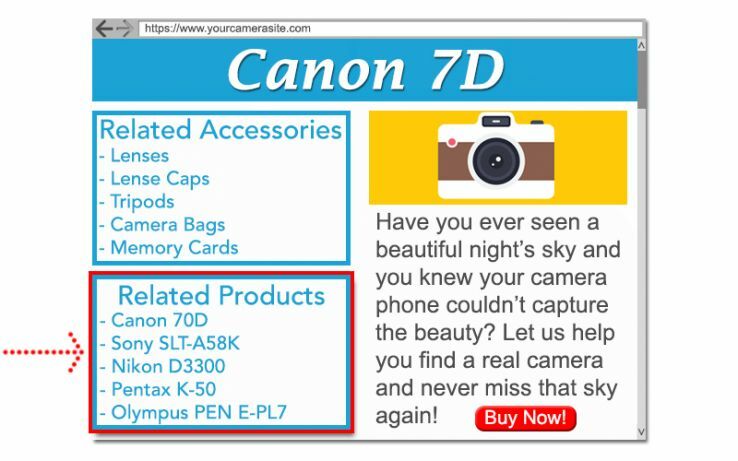 Again, the freedom given to the Moz users is making difficult to retrieve unique information on a subcategory level. If we want to find questions that are completely devoted to Analytics, then we must focus on the word Tracking. Doing so, we find the most interesting questions, mostly about Google Analytics implementation issues (how to set up goal with event tracking, Ecommerce GA implementation issues, custom URL tracking, etc.). they manifest a need. Maybe is it time for creating a very practical Google Analytics Implementation Guide or Cheat Sheet? Personally, this is my favorite Q&A category. Why? Because in it we can find questions about international search, alternative search sources, and a space for discussing the most advanced trends in search and everything related to audience targeting. We could define it as a category devoted to strategy, but that doesn’t forget to translate it into concrete tactics. What are the Search Engine Trends Moz users discuss? Looking at the word cloud, something doesn’t add up here. Where are Hummingbird, Knowledge Graph, MyAnswers, semantics, and patents? Instead of those terms, we see: ranking(s), drop(ped), bad, traffic, update, penguin, duplicate and semantically related words. Search Engine Trends is practically a synonym for penalties, and—let me tell you openly dear Moz community members—penalties are not a Search Engine Trend. Only three questions about Knowledge Graph have been asked in 12 months. Four about Hummingbird (two of which by people convinced Hummingbird penalized their sites!). A topic like Personalized Search—which should be talked and asked about here—is completely absent. Something is wrong here. Probably the Search Engine Trends subcategory is just another category users classify their questions for because they have this option. Or, maybe, Moz (and I count myself in) still has not being able to create the right awareness about the importance of being constantly updated about how search engines are evolving. Or Moz users simply are more interested in finding immediate answers for very practical needs; and if it is under the aspect of tips and tricks better. 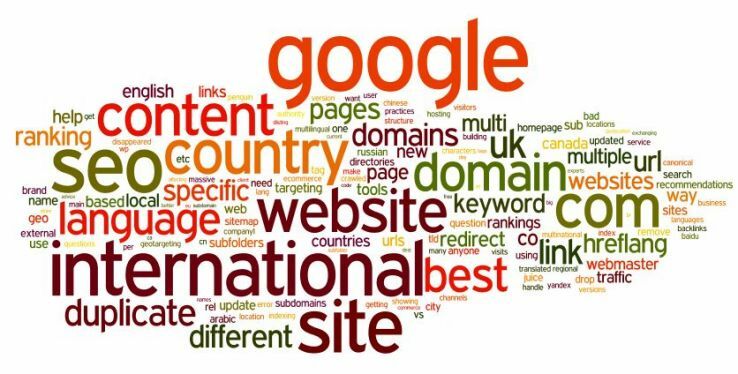 localization vs. simple translation, the correct implementation of the hreflang annotations, keyword research for multi-country sites, and how to deal with social media for multinational businesses, all are present with a many grades of difficulty. I am surely biased, but the International Issues subcategory is the best example of what a Q&A category should be: clear in its nature. In seriousness, apart from this obsession with the Big G, it’s interesting to notice the presence of Bing, Yahoo, and the very few questions about Baidu, Yandex, and Naver (only two!). It’s clear that Moz users are spending 99% of their time on Google and only allocate a very tiny amount of time to other search engines. It is also clear that SEO outside of the classic American-focused search engines is not something they are concerned about (probably because they are not dealing with it). strong decrease in questions about Behavior and Demographics. Why? Because people aren’t really asking questions about those topics, and the biggest percentage of the questions classified as Behavior and Demographics are what I’ve defined as “duplicates” of other categories. Community is a Q&A category mostly meant as a space for discussing topics about the inbound marketing industry, not one where people ask for help. 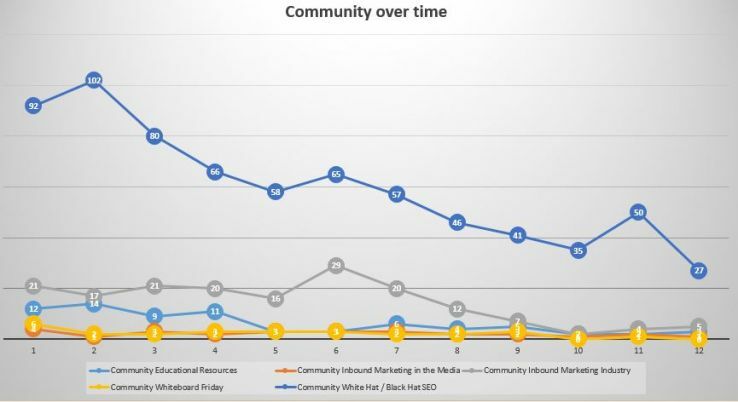 Seeing that the only topic within Community that really matters to the Moz users is White Hat / Black Hat SEO is quite depressing, but it reflects the worries SEOs have for practices like Negative SEO or penalizations for spammy link building tactics that have been used in the past. Mozcon and Articles, but they are just few words between many not relevant ones. If I was Moz, I would seriously reconsider this category. 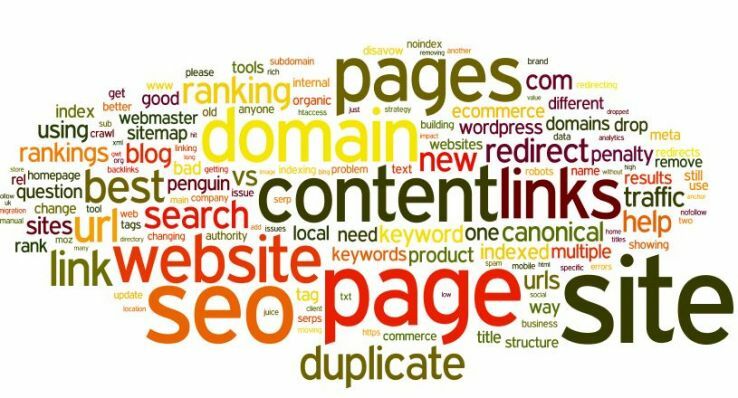 category mostly used by independent SEO consultants or owners of small SEO companies. This may explain why only 504 questions have been asked in Business Development. 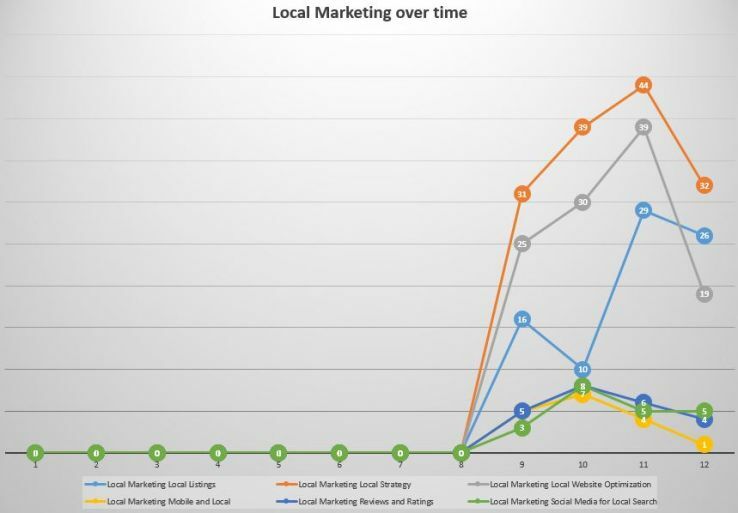 Local Marketing is a relatively new macro-category; it was created on January 2014. What surprised me was (finally!) seeing “schema” present in the word cloud. Q&A section, at least in Moz’s case, is also a place a company can use for offering customer service. advantage of using Q&A for this purpose is that the company itself can collect useful data about their own products perception, weakest points and needs the users are expressing. 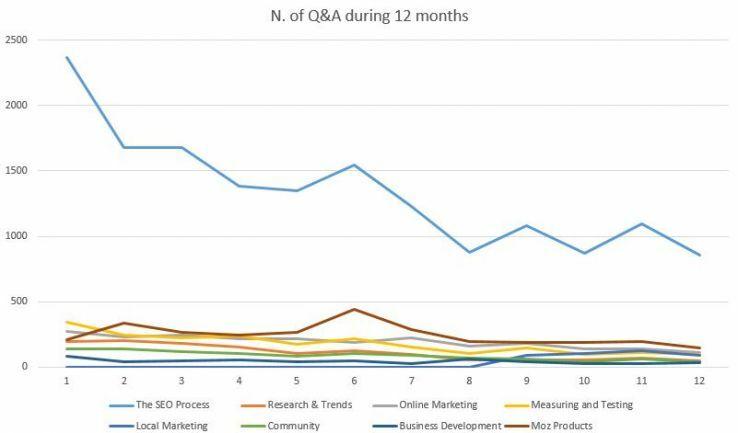 Initially, the support side of the Moz Q&A was limited to two categories (Moz Products and Pro Application), but during this last twelve months Moz rationalized the questions creating a taxonomy based on the different areas of Moz Analytics (Search, Social, Links, and Brand Mentions) and stages of learning the tool. Finally, specific Q&A categories were created for all the other tools owned by Moz (Moz Local, OSE, Followerwonk, APIs). Moz users are SEOs, maybe adopting inbound marketing as a way of thinking, but ultimately SEOs. For this reason, we can say that the partial return Moz is doing onto focusing again more on SEO practitioners, even if under the inbound marketing philosophy, is very well justified by the composition of its audience. Not that other inbound marketing facets of Moz Analytics are not considered useful, but they are not considered as essential as the SEO ones. One thing, though, clearly emerges from analyzing the Support Q&As: the strength and participation of the Moz community itself. In fact, the biggest percentage of the answers given to these questions are from Moz users. The Moz community is generally proactive: only 2,120 over 11,555 questions (de-duped count) didn’t received fewer than two responses. Inbound Marketing seems considered as a new framework where SEO is included, but SEO substantially seems considered as having the same functions it had before. The analysis—to conclude this gigantic post—is telling us something we all need to reflect on: inbound marketing still hasn’t put solid roots in the minds of search marketers, and despite what the biggest majority of the Moz community says publicly, it seems it’s still thinking in terms of the old classic SEO. 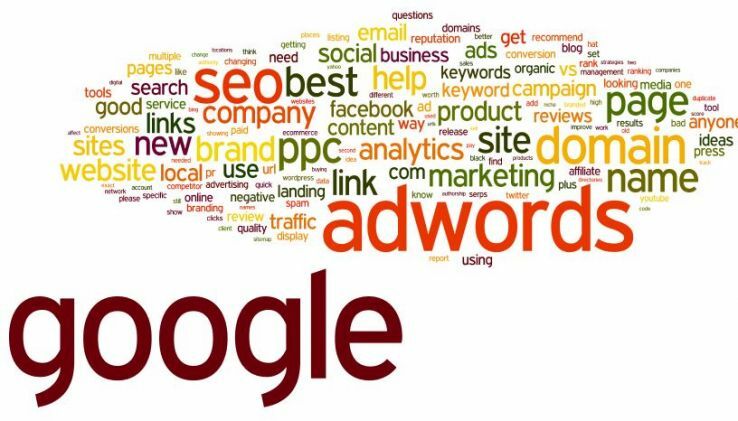 Small to medium businesses can benefit from the correct search engine optimization strategies. They can attract more customers by improving their ranking in search engine results. Advanced SEO practices can boost the visibility of any company with the help of other marketing strategies such media outreach, social media and reviews. The first advanced SEO tip for small businesses is to optimize the data found on the company’s website. Your online presence depends on your website. It has to have a domain name that reflects the business and its location. 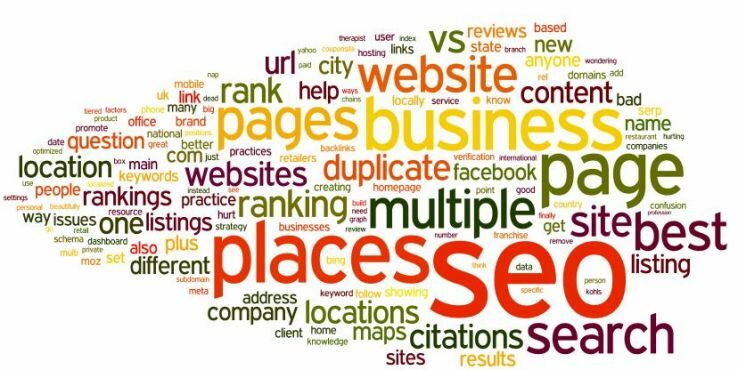 The website must also use keywords on page titles that show the type of business, your services, and location. Your business’ name, address and phone number data should be found in all pages of the website. Aside from focusing on the services you offer, your website must also have content related to the where the company is located. It makes it easy for local customers to find your business. Another advanced SEO practice to improve local visibility is to place your business’ information in several third party sources. 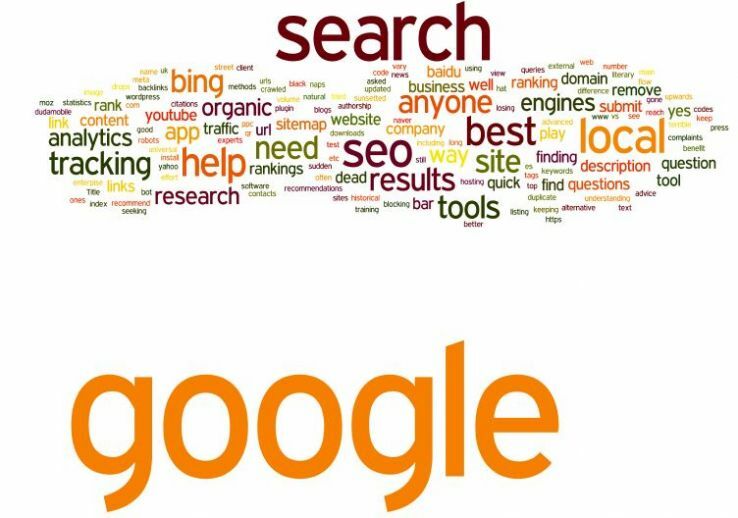 Search engines such as Google scan a lot of websites to improve their understanding of the local business environment. Such of the websites that you can use are Google+, Facebook, TripAdvisor and Yelp. 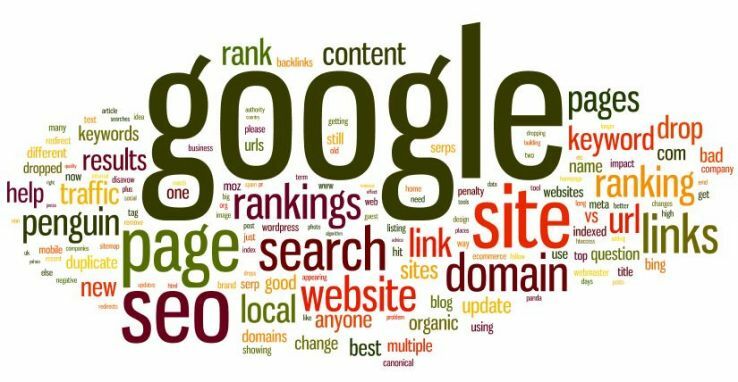 It is a good search engine optimization practice to include the website URL, photos, videos, and other vital details to appeal to potential customers. It should be placed in the proper category. This way search engines will be informed about what type of services and products your business provide. If your small to medium business has several locations, make separate listings for each location. This will improve the visibility of the company as well as the individual stores. Search engines will list the different store individually. Another advanced SEO tip is to have a good link strategy. The links you place from your website to other sites, and the other way around is vital in improving search engine ranking of your company. Unrelated links will only hurt your online credibility. Good search engine optimization involves sharing links to your company’s website through your accounts in social networking sites. 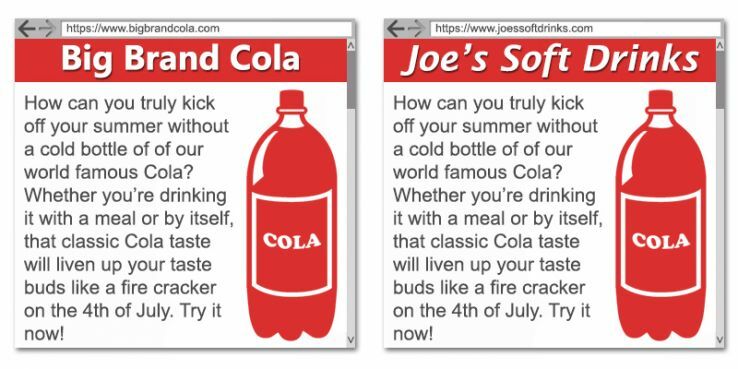 You should also encourage other users to share the information. Newsletters and other updates sent out to customers must include links to your website. Another way to spread the word about your website is to support local events in the community. Then ask the local chamber of commerce and other partners to share the link to your website when talking about the event. Your business’ online presence will be improved by user reviews. One advanced SEO tip is to respond to every review, whether they are positive or negative. Small businesses must encourage customers to leave reviews of the business. The reviews must be authentic to gain the trust of local customers. Posted in Expert SEO Consulting	| Tagged ... ..., ... ..., ... ..., ... ..., ... ..., ... ..., ... ..., ... ..., ... ..., ... ..., |Add, |Adword, |Adword Keyword Tool, |GoogleAdwords, About, Accounts, Address, Advanced, advanced seo, advanced SEO practice, Advanced SEO practices, advanced SEO tip, Agency|Company|New, Agency|Company|San, Another, appeal, Area|, Around, attract, Benefit, Boost, Business, business provide, Businesses, Category, Chamber, commerce, Community, Company, Consulting|Search, content, CORRECT, correct search engine, credibility, Customers, Data, Design|Social, Details, Different, Domain, each, Easy, encourage, Engine, engine optimisation, engine optimization, engine optimization practice, Engines, environment, Event, Events, Every, Expert|Seo, Facebook, find, first, Found, from, GAIN, Good, good link, good link strategy, good search engine, Google, Have, Help, hindi|Seo, Hurt, Improve, Improved, Improving, Include, individual, Information, Keywords, link, Links, List, Listings, Local, local business, local business environment, local chamber, local customers, Local Events, local visibility, location, locations, Makes, Marketing, marketing strategies, marketing|6198318589|Best, Marketing|Automate, Marketing|Get, Marketing|Great|Increase|Business, Marketing|Search, Marketing|Web, Media, media outreach, Media|Multimedia, Medium, medium business, Medium Businesses, Medium Businesses Small, more, Must, Name, Negative, Networking, number, Offer, Online, online presence, only, optimisation, Optimization, optimization strategies, Optimize, outreach, Page, Page Titles, Pages, partner., Partners, party, phone, phone number, phone number data, Photos, place, placed, Positive, potential, potential customers, Practice, Practices, presence, products, Proper, Provide, Ranking, Related, respond, Results, Review, Reviews, Samuari |Search Engine, Scan, Search, search engine, Search Engine Optimisation, Search Engine Optimization, Search Engine Ranking, search engine results, search engines, SEO, SEO practices, SEO tip, SEO|6198318589|Best, Services, services|203, Services|JG, share, sharing, Should, Show, Sites, Small, small businesses, Social, social media, social networking sites, Sources, Spread, Store, Strategies, Strategy, Such, Support, Talking, techniques|what, their, They, Third, Through, tip, Tips, Titles, Traffic|Best|Online, Tripadvisor, trust, TUTORIALS | LINK, type, Understanding, Updates, URL, use., User, Users, Video|Marketing|Video, Videos, Views|New|Online, visibility, Vital, way, way search, Website, website URL, Websites, Well, Wineries Geelong wineries|, Word, Yelp, you.